A beautiful, innovative building for deaf children that has been made with local earth, local hands and local heart. The concept of building with clay is millions of years old and it is still generally regarded as a primitive and niche building material. Yet around the world, inspirational, game changing architects are passionately working to re-brand clay as a building material of the future, a building material that solves more problems than it creates, a material that has the potential to seriously disrupt the concrete and steel age. 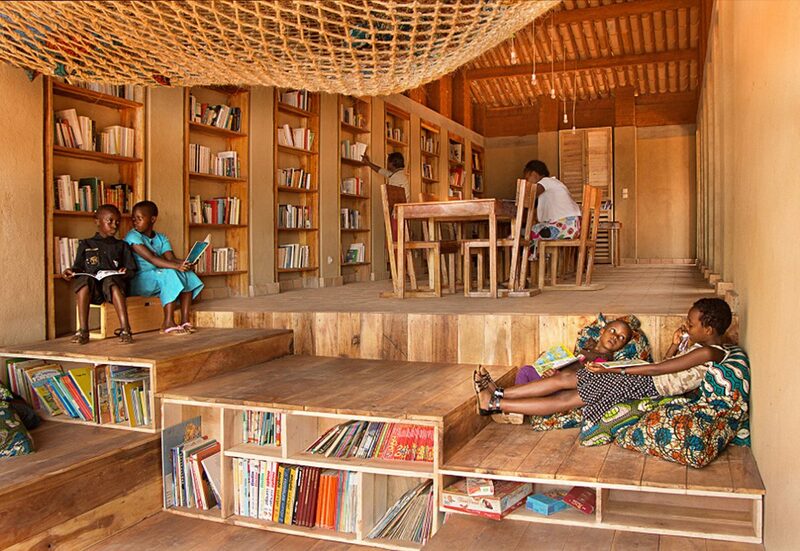 Clayworks, while not involved in this project, are particularly moved by the Story of the Library of Muyinga in Burundi, led by BC Architects and Studies of Brussels, which tells and shows how this building was conceptualised, designed and built by members of the local community using only readily available human labour rather than carbon hungry processes and that uses an abundantly, locally available material: earth. Students from Belgium travelled to Burundi to help and share knowledge on every aspect of the design and build. ‘Whatever the group, everyone joins in small on-site prototyping workshops on diverse topics such as CEB production, adobe production, earth analysis, bamboo weaving, sisal weaving, foundation solutions, furniture design, and so on, in an atmosphere of mutual contact and respect with local craftsmen, whereby knowledge of all involved is shared’. To lead on a project that uses time, hands and heart, sweat, fulfilment and creativity rather than automation, imports and carbon shows a visible concern for the people, the place, the planet and beauty. ‘Architecture is a tool to improve lives…for building up communities…building up the confidence of the people and building up their skills and offering a lot of work opportunities to the people and also caring for beauty and a cultural identity because this is very strongly linked to dignity’. A focus on meaning – the new architecture. ‘We are entering a new age of architecture – one where we expect our buildings to deliver far more than just shelter. We want buildings that inspire us while helping the environment: buildings that delight our senses while serving the needs of community; buildings made possible both by new technology and re-purposed materials’.